The catapult was invented in 399B.C by Dionysus the Elder, ruler of the Greek town of Syracus in Sicily. Dionysus devised the catapult as a warfare weapon to be used against the Carthaginians. The design of the early catapults was very similar to crossbows as they were the only inspiration available then. Dionysus gathered a team of accompolished artisans for developing the Catapult. He showered his artisans with extravagant gifts and huge salaries in lieu of creating this device. The catapults known as ballistas back then were designed to hurl heavy and strong objects over a large distance. The major difference between ballistas and the newer catapults is that the ballistas used two wooden arms whereas improved models use only one wooden arm. A further improvised version of the Catapult known as the Mangonles was developed later by the Romans. These used only one wooden arm and had a relatively simpler design. The mangonles could hurl sharper and heavier objects at enemies at an increased speed. 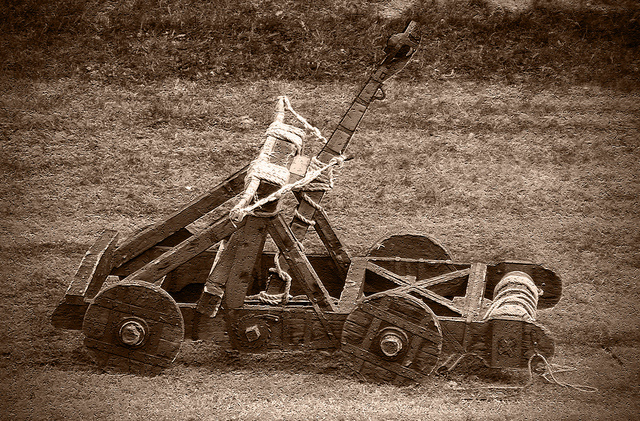 The next step forward in the evolution of Catapults was the Trebuchet, which revolutionized the concept of Catapults. The trebuchet was developed by the French in the 12th century and was a very powerful weapon capable of mass destruction. The history of Catapults has evolved over the centuries, with designs getting more elaborate and hence capable of more damage. The concept of the catapult has aided modern creators in the design of sophisticated warfare. Sam Reese is a web enthusiasts and blogger. He is a history student and loves to write and read histories of different things.